In 1649 the Spanish King Philip IV married for the second time — to his niece Maria Anna of Austria. This marriage was also celebrated in the Spanish Netherlands, which were ruled by Archduke Wilhelm Leopold, son of the Holy Roman Emperor Ferdinand II. As with nearly all members of the Habsburg dynasty he was an active patron of the arts and founded a chapel in which musicians from Italy and Austria were joined by local forces. In 1648 he appointed Giuseppe Zamponi as director of chamber music. He was born somewhere between 1600 and 1610 in Rome and was for some time in the service of Cardinal Pier Maria Borghese, until the latter's death in 1642. It was this Zamponi who was commissioned to compose an opera which was to be performed in 1650 as part of the celebrations of Philip IV's marriage. The first performance took place on 24 February, followed by a second two days later. In 1655 it was performed once again for the Swedish Queen Christina, who visited Brussels on her way to Rome after she had abdicated following her conversion to the Roman Catholic Church. She liked the opera so much that she wanted to hear and see it a second time. She was not the only one who greatly appreciated Ulisse all'isola di Circe. The first performance was "a success, to the inexpressible admiration and happiness of the audience", as a newspaper stated, and the second performance was attended by even more people. They were not only impressed by the music, but also the production, as it required no fewer than nine set changes and a great quantity of stage machinery. It was the talk of the town for years to come, also because it was the very first opera ever performed in Brussels. Ulisse (or Odysseus) is a figure from classical antiquity who stirred the imagination of writers and composers. Zamponi's opera is about him landing on an island ruled by Circe, a sorceress. She turns some of his soldiers exploring the island into statues. Ulisse wants to rescue them, and with the help of Mercury is able to protect himself against Circe's sorcery, but falls in love with her. It is Mercury again who comes to his rescue and brings him back to his senses. Ulisse decides to leave Circe and return to his wife and son. Zamponi's opera is in three acts, preceded by a prologue. It is in the tradition of the Venetian opera to which also Monteverdi's Il ritorno d'Ulisse in patria belongs and with which Zamponi's opera obviously has something in common. 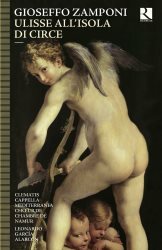 Monteverdi's opera documents the stylistic changes which took place in the second quarter of the 17th century. One of its features is the introduction of more lyrical episodes, which one could call ariosos, and which point in the direction of the aria which was to become the standard in opera at the end of the century. This development comes even more strongly to the fore in the operas of Francesco Cavalli, who was the dominant composer for the theatre in Venice after Monteverdi's death. Zamponi's Ulisse all'isola di Circe shows strong affinity with the latter's operas. Despite the subject I didn't find this opera very dramatic. I still wonder whether that is due to the composition itself or the way it is performed. It is probably a combination of both. Circe may be a sorceress, but she doesn't seem very fearful. One never feels that Ulisse is in real danger, not even after he has decided to leave Circe. The sorceress is mad but her reaction is rather modest. Céline Scheen certainly gives a fine performance, and she manages to show the two sides of Circe: her sweetness when she enjoys Ulisse's love and her anger when he tells her that he will leave her. Even so I feel that she could have made more of the sorceress's anger. Right from the start Venus is Ulisse's fiercest enemy who wants to make his life as miserable as possible. Mariana Flores sings beautifully, but is too harmless and sweet. Venus is a rather unpleasant character, but aspect that doesn't fully come off here. The opera ends in a rather odd way. Mercury convinces Ulisse that he should leave Circe and go home. This brings him into conflict with Venus, and they quarrel over his actions. This comes to a climax in the sixth scene of the third act when they both fly to heaven to state their cases before Jupiter (Giove). However, his verdict never comes. Instead in the last scene Jupiter and four gods sing the praises of Philip IV and express joy about his wedding. Here the opera turns into a kind of serenade, and the drama more or less melts away. In the mid-17th century comic elements became an indispensable part of operas. Comic characters were often travesty roles. That is probably the case with the role of Argesta too, but this part has been partly transposed and the liner-notes are silent as to the kind of singer for which the part was originally scored. This part is performed by the alto Dominique Visse, a specialist in this kind of roles. Whether one appreciates his singing is a matter of taste, and he sometimes tends to go a little overboard. However, this role has a tragic side as well, and he brings that out very well indeed. Another role that has been transposed is that of Satiro, originally scored for baritone, but here sung by the alto Fabián Schofrin. The singing is generally outstanding. There is a strong amount of stylistic unity, as the singers all show a command of what was the ideal of the time: recitar cantando, speechlike singing. The ornamentation is stylistically convincing as well, and the singers rightly don't overdo its application. I already mentioned some shortcomings in the interpretations of the roles of Circe and Venus. Zachary Wilder gives an outstanding account of the part of Mercury, and the bickering between Mercury and Venus is one of the nicest parts of this performance. Furio Zanasi is well cast in the role of Ulisse. He doesn't sound very heroic, but that is just about right, because Ulisse is not exactly a heroic figure in this work. The smaller roles are all performed well, some by members of the choir. The Choeur de Chambre de Namur is an excellent ensemble and one of the assets of this recording. The scores of operas of this time leave much to the interpreters, especially in regard to the instrumental line-up. García Alarcón has taken quite some liberties, and I am not certain that all of these are justified. It is more than questionable whether so many instruments were involved in opera performances in the mid-17th century. Some decisions are defended with reference to the festive character of the occasion. That is a valid argument, but I feel that there is too much wishful thinking here, and that the scoring probably reflects the conductor's personal preferences rather than historical circumstance. In previous recordings he often took decisions which were not feasible from a historical point of view. Setting aside the critical notes the release of this production is a reason to celebrate. Zamponi's music is very enjoyable, and the singing and playing are of a high standard. This recording shows that there is still much to discover and that it is a shame that so few operas from the mid-17th century are performed and recorded.